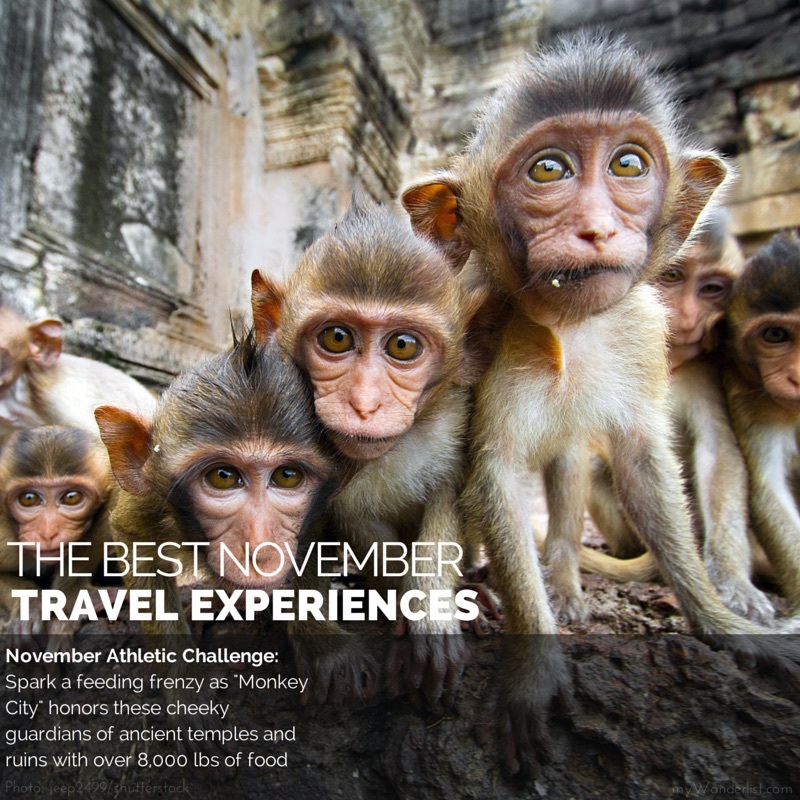 Which ones will you add to your bucketlist? 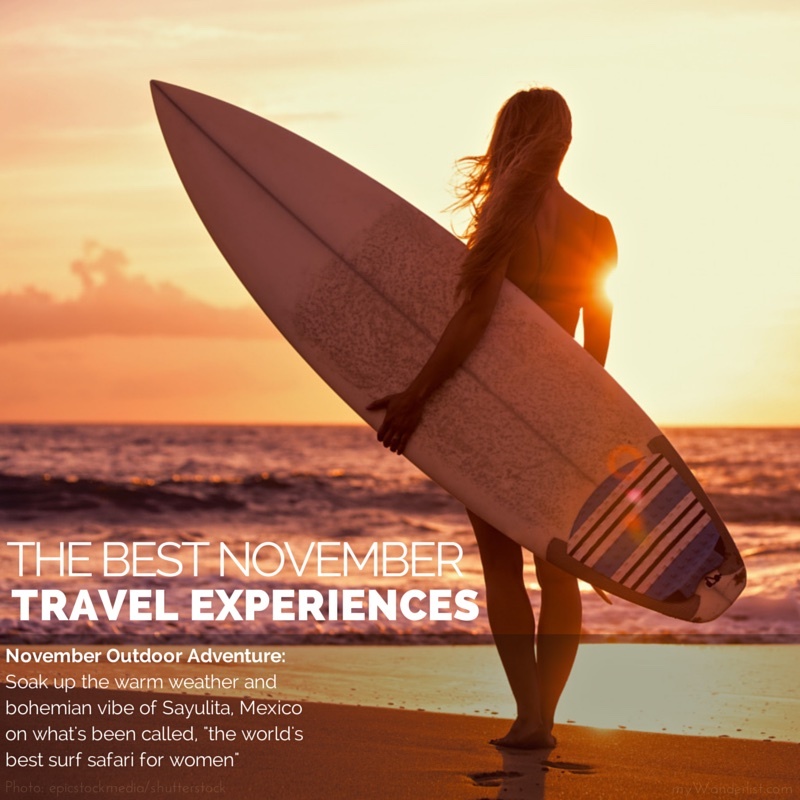 November is the best edition of monthly travel experiences yet with travel experiences that push the limits, engage with authentic culture, encounter animals in the wild, participate in the most iconic athletic challenges and find pure bliss. Everyone has different tolerances for risk, so please check safety conditions and plan appropriately. 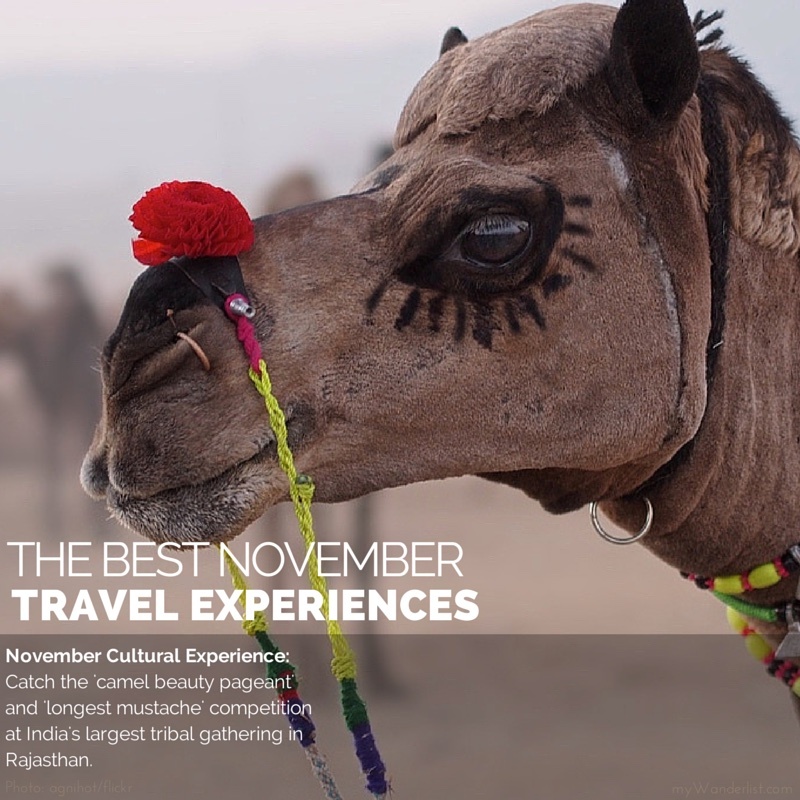 November brings the dry season to Southeast Asia and Central America to kickoff the seasons in those iconic backpacking destinations and ushering in festival season. 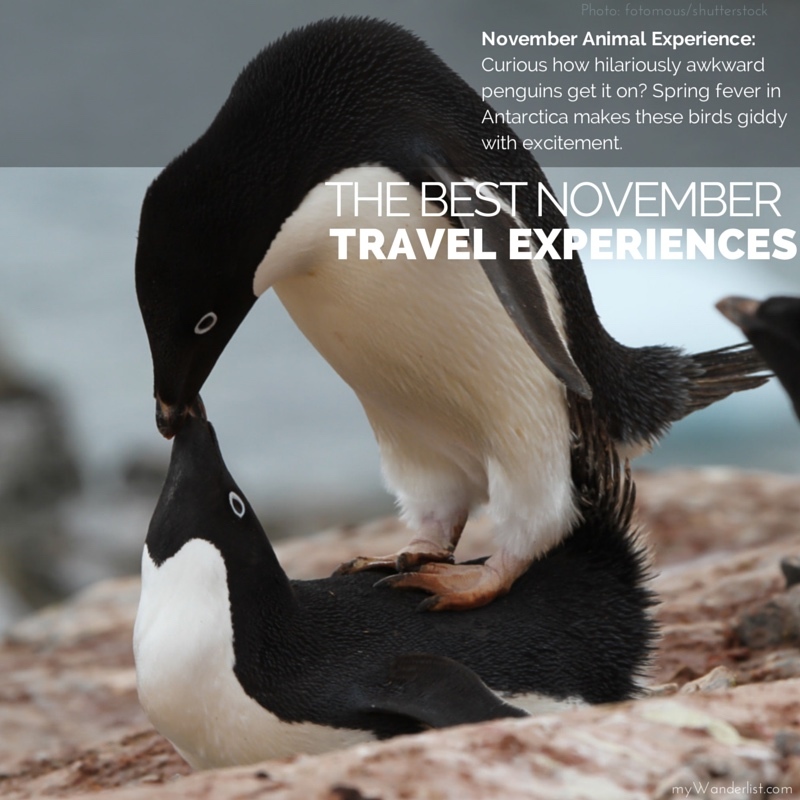 Antarctica, Patagonia and New Zealand enjoy spring fever and as the Middle East gets a break from sizzling temperatures, the far north begins to freeze over allowing some interesting animal encounters. 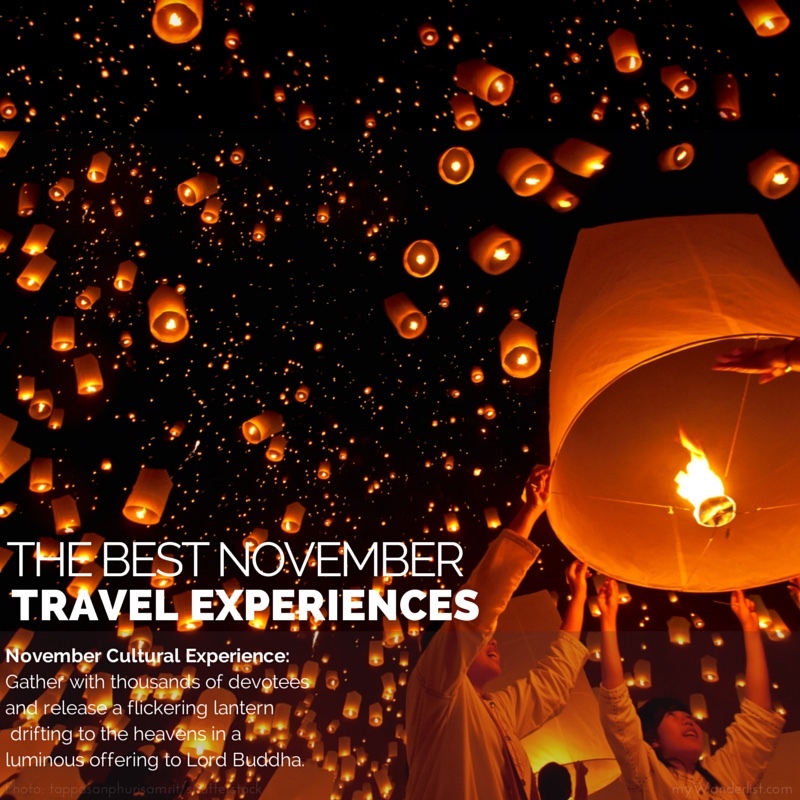 Featured experiences are the lantern festival in Thailand (there are several), Scuba diving cenotes and underground rivers in Mexico, The largest tribal gathering in India and tracking wolves in Yellowstone Park. 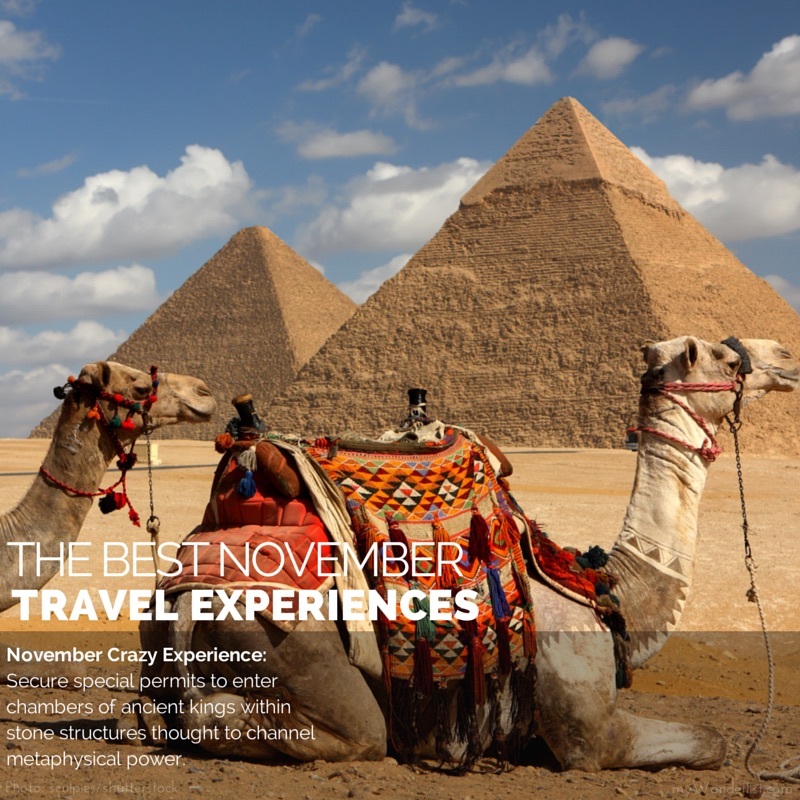 You can find links to some of the best travel blogs, experts who have been there and official information sites to make your research easier. This is an evolving list and I am always looking for fresh and exciting experiences to add, so let me know any amazing things you’ve heard about and your favorites so I can make sure they stay on the list. Want to see what it feels like to live in a cave? 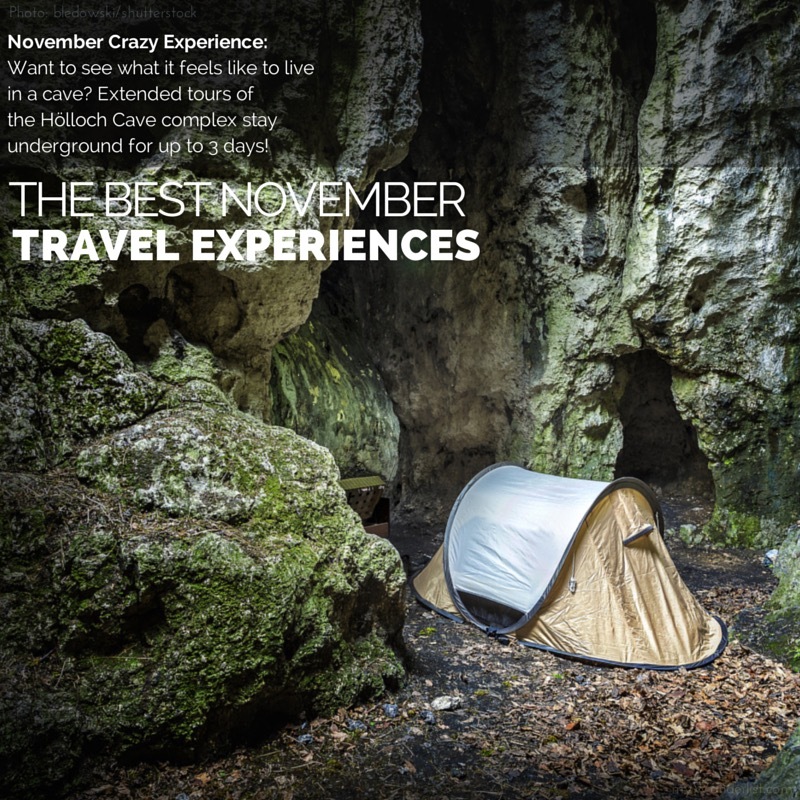 Extended tours of the Hölloch Caves, one of the longest cave complexes in the world. Stay underground for up to 3 days! Go spelunking or simply exploring in this mysterious underworld. For the ultimate experience, take a three-day trip and stay overnight at a bouviac. 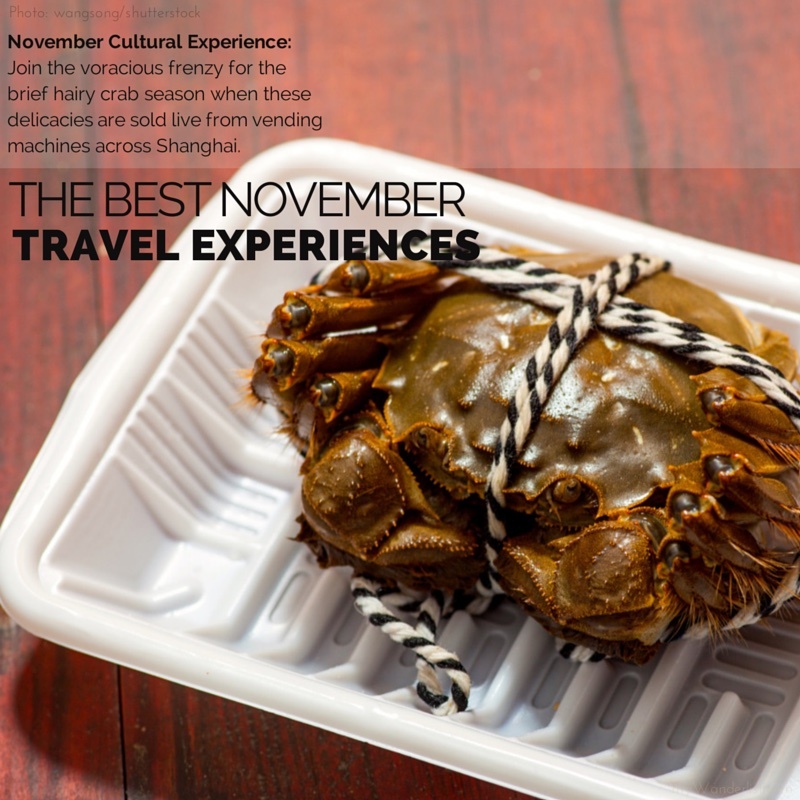 Longer tours are offered from November to March. 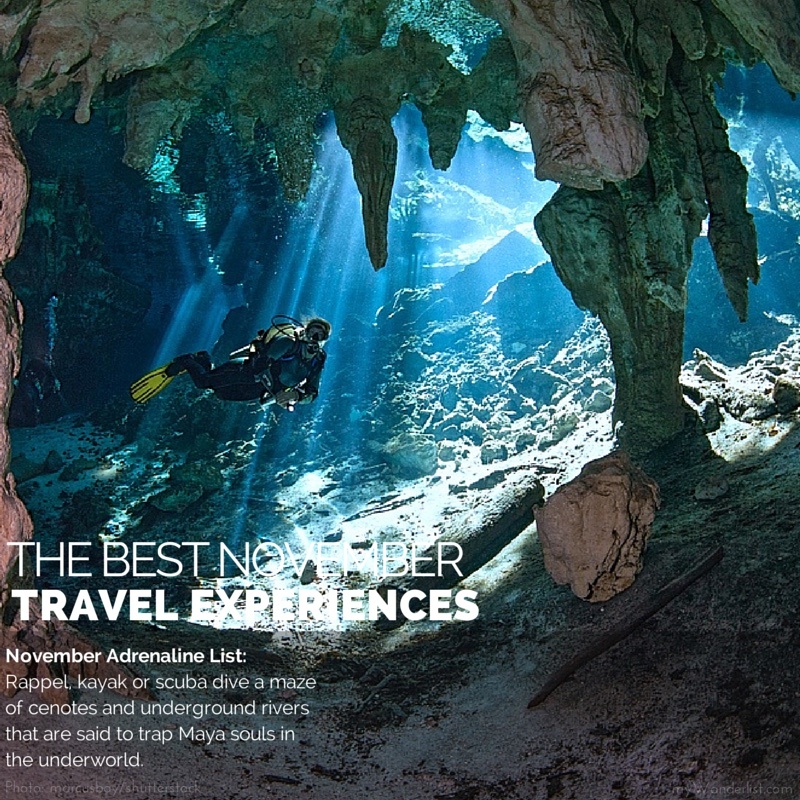 Rappel, kayak or scuba dive into a maze of cenotes and underground rivers that are said to trap the souls of the ancient Maya in the underworld. An ancient meteor turned Mexico’s Yucatan peninsula into honeycomb of caverns, cenotes (sinkholes) and underground rivers allowing you to scuba dive areas like Dos Ojos. Cenotes offer a plethora of adventure activities including kayaking, rappelling and zip-lining into the underworld. The best view of Dubai’s futuristic skyline is from the air at terminal velocity or from the top of the world’s tallest building. 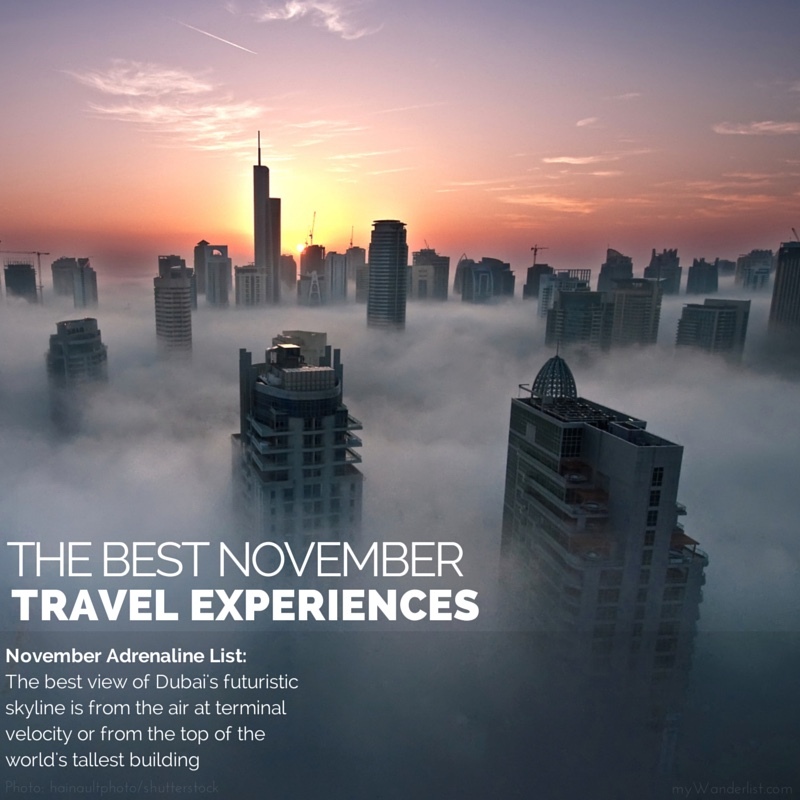 November brings a welcome escape from the sweltering summer temperatures to this Arabian wonderland and a clearer view of the Dubai skyline from the top of Burj Khalifa. Skydivers in Dubai get the view of the famous palm islands approaching them in free-fall. The fastest everything in Abu Dhabi- the fastest roller coaster at the largest indoor park during the Grand Prix (Nov 21-23, 2014) The fastest roller coaster in the largest indoor park during the Grand Prix. Ferrari World is home to the Formula Rossa roller coaster that goes 150 mph. Visit during the Abu Dhabi Grand Prix (Nov. 21-23rd, 2014) to get your speed fix! Enjoy the spiritual sunrise over the temples of Bagan the way it was intended. Marco Polo called Bagan “one of the finest sites in the world,” and this capital city of the ancient Burmese kingdom is surreal to explore. So large that you are bound to feel like you are ‘discovering’ them for the first time. Tourism has arrived in Burma, though, and sunrise spots are extremely crowded. It is hard to believe that these 4000 temples are like Russian matryoshka dolls protecting massive Buddha statues. (Nov. 7th, 2014) Runners in the Sharm el Sheikh Half Marathon scale sand dunes and race alongside the coral reefs and breezy mangroves of the Red Sea. Destination athletes will love this one! The course runs through Ras Muhammad National Park, known as one of the most beautiful and interesting driving and diving sites in the world. 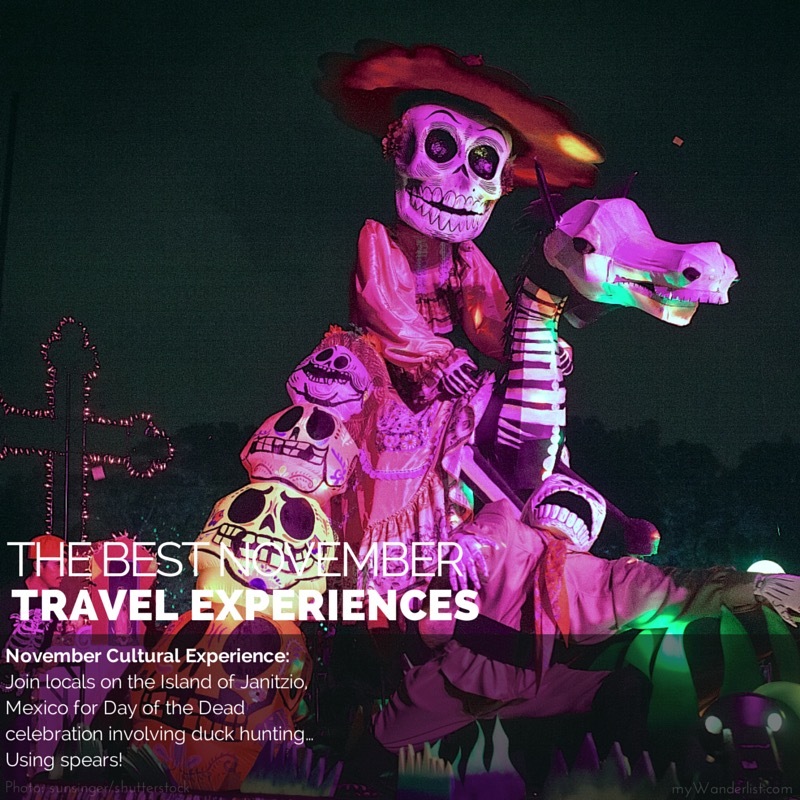 (Oct. 31st – Nov 2nd, 2014) Join locals on the Island of Janitzio, Mexico for Day of the Dead celebration involving duck hunting… Using spears! The hunted ducks are prepared with whitefish from the lake and local chilies for traditional fare. The following day involves an altar decorating contest, a butterfly net dance, and a beautiful procession of torches. 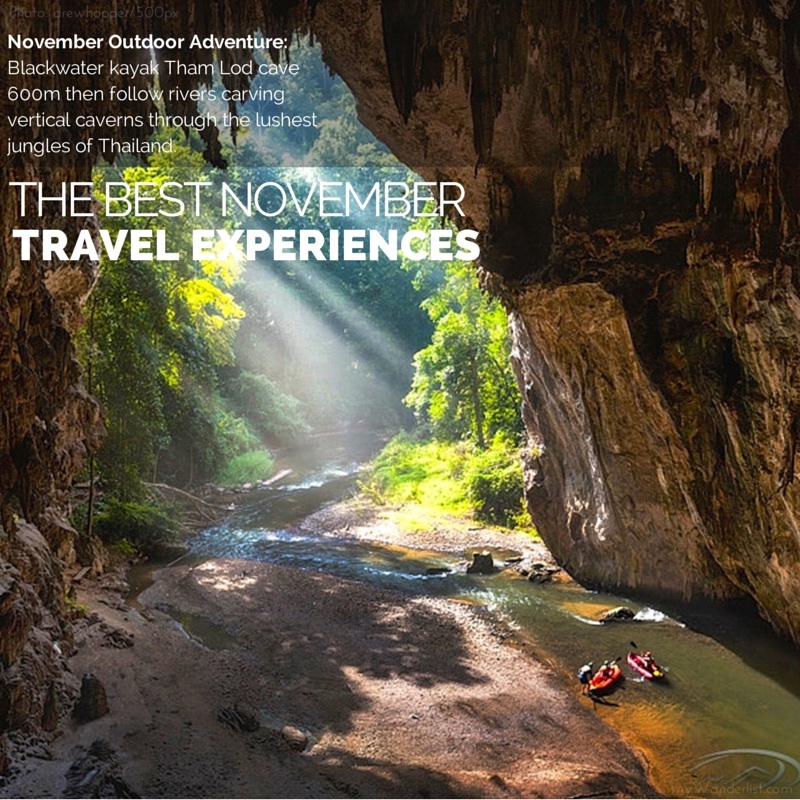 Blackwater Kayak Tham Lod cave 600m then follow rivers carving vertical caverns through the lushest jungles of Thailand. The cave is completely dark inside, so you will need a guide and a flashlight to explore. 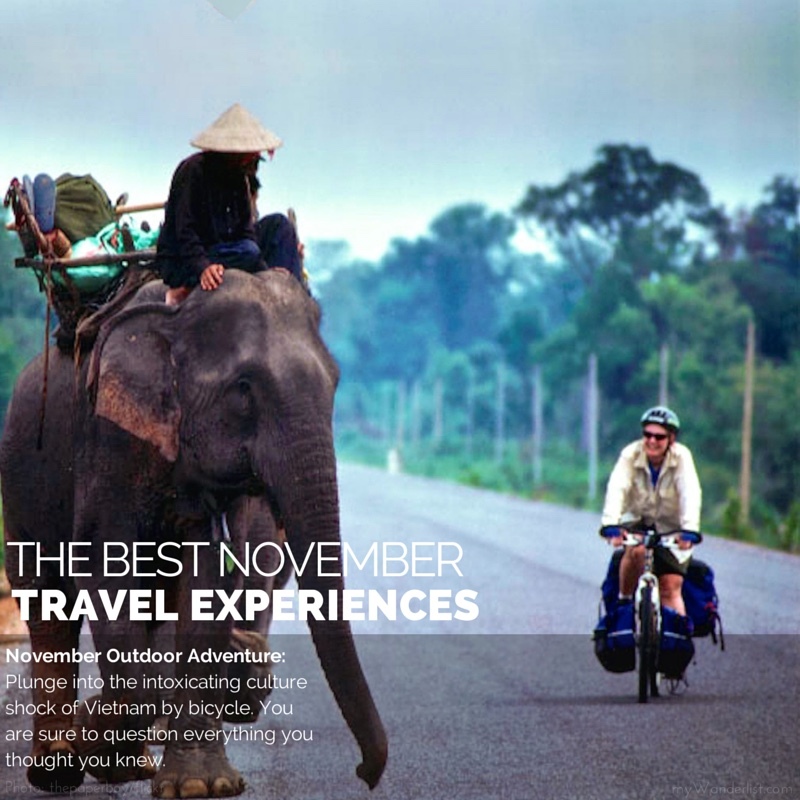 2-day wilderness kayaking trips navigate the best whitewater rivers in Northern Thailand and camp streamside overnight. Hear the footsteps of the lone wolf tracking his prey in the ghostly calm of snow-covered Yellowstone Park in the wintertime. 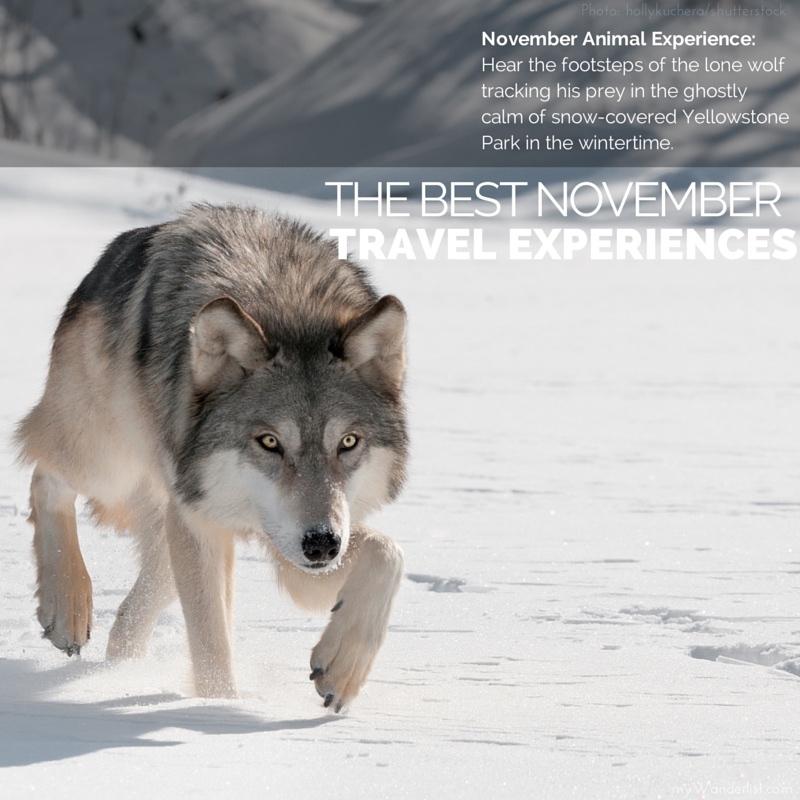 The eerie, ghostly calm of winter is the perfect time to join an expedition tracking wolves through Yellowstone Park. Winter brings these reclusive creatures out during the day when the prey is easier to spot. The best months for wolf tracking is late October through March. 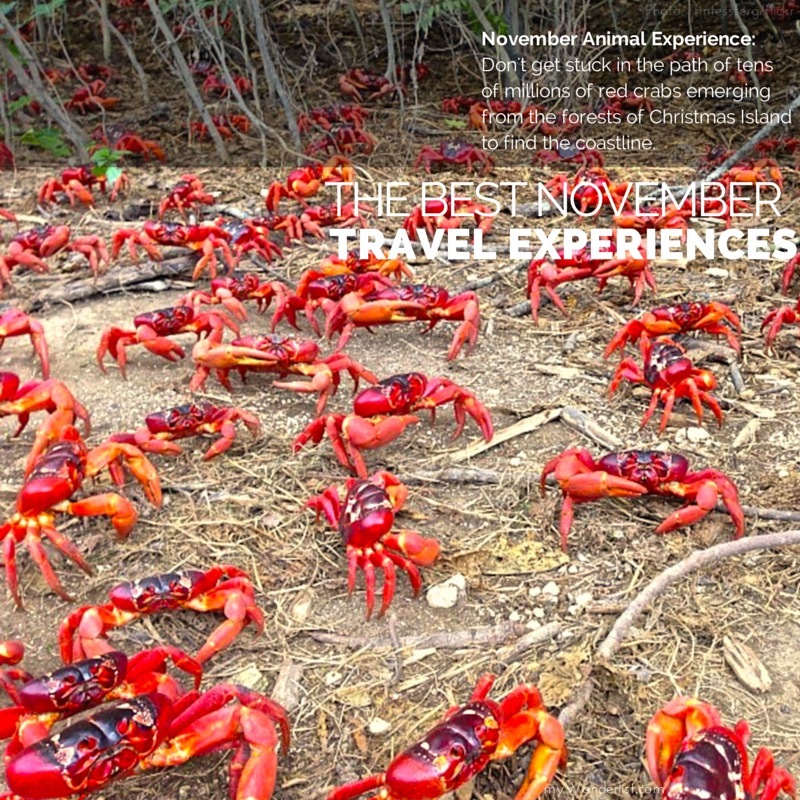 Don’t get stuck in the path of tens of millions of red crabs emerging from the forests of Christmas Island to find the coastline. Once a year in late October, over 40 million bright red crabs emerge from the forest to find the coastline for mating. The flood of crabs strangles traffic and park rangers set up fences and funnels for safe “crab crossings.” The sight of the ground moving with red legs is spectacular. And freaky! Bald eagles migrate in abundance to a spot on the Chilkat River where percolating warm water attracts the last of the spawning salmon. 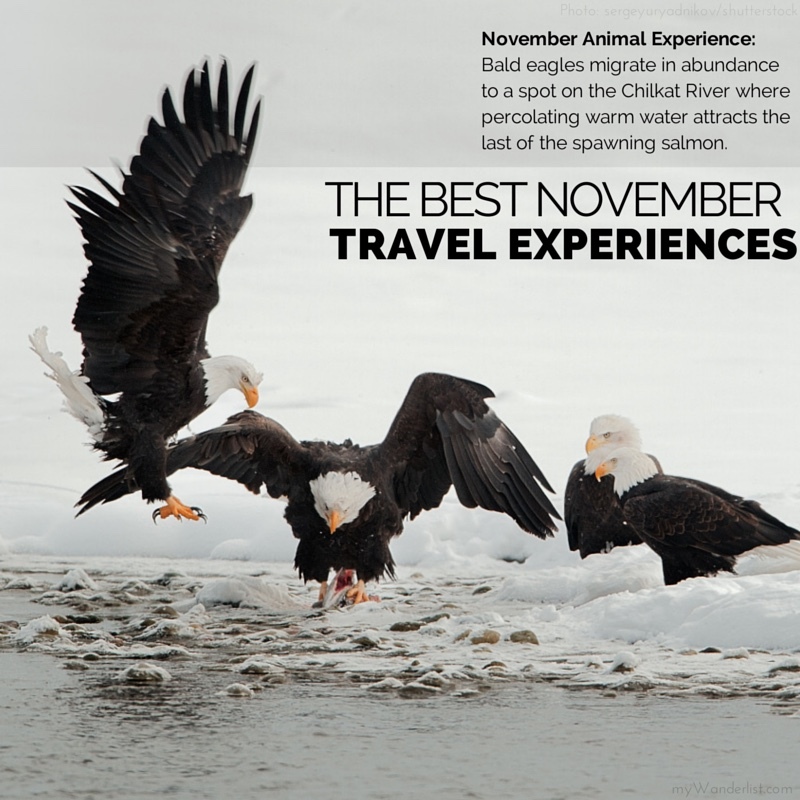 The “alluvial fan reservoir” is a natural phenomenon along the Haines Highway between miles 18 and 24 provides the main viewing area for eagle watchers in late fall and winter and the high concentrations of eagles last from October through February. I’ve seen a few Bamboo, Sak Yant, Tattoos lately, sounds like such an awesome experience! My husband, Michael, just got a new travel inspired tattoo. He wrote about it along with a bunch of others. Check it out on our site, and let us know what you think! Lovely list! I’ve always wanted to go on a safari in South Africa, and two additions to the list for me would be seeing an opera in Europe and visiting all 50 US states. Thanks for sharing! Thank, Craig! 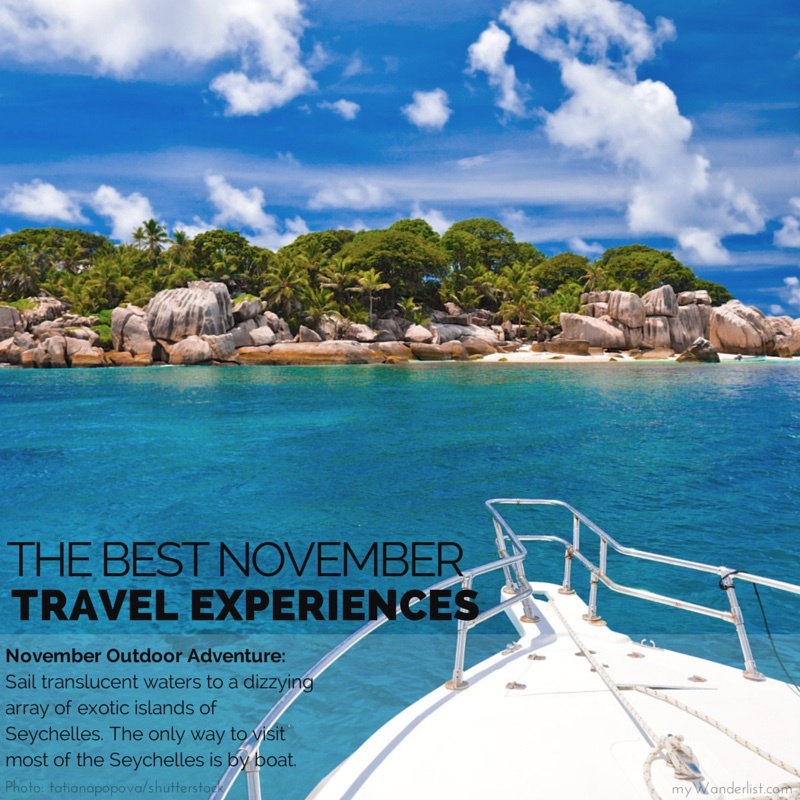 Sailing the Seychelles is one from my personal bucket list. Learning to sail has always been a dream of mine and there’s no place more exotic to do this than the Seychelles. Where is your next trip? This post gives so many wonderful places to travel to. Whitewater rafting in Costa Rica, going on a safari in West Africa, and seeing wildlife in Yellowstone National Park all sound like fun options to me. Thanks for sharing these! 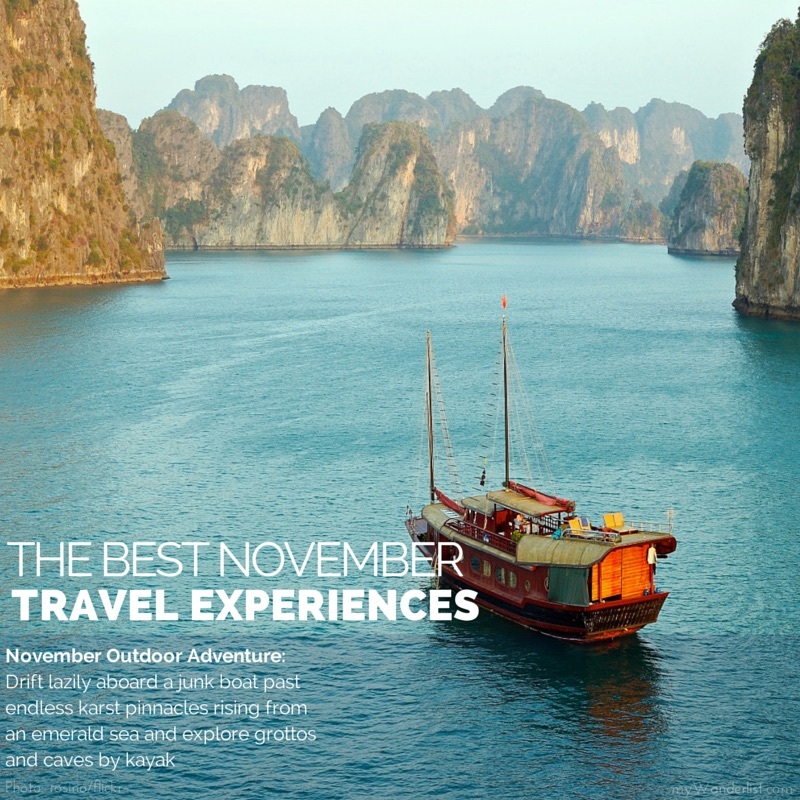 As always, awesome list of travel experiences. Thanks for sharing. Thanks, Lance. 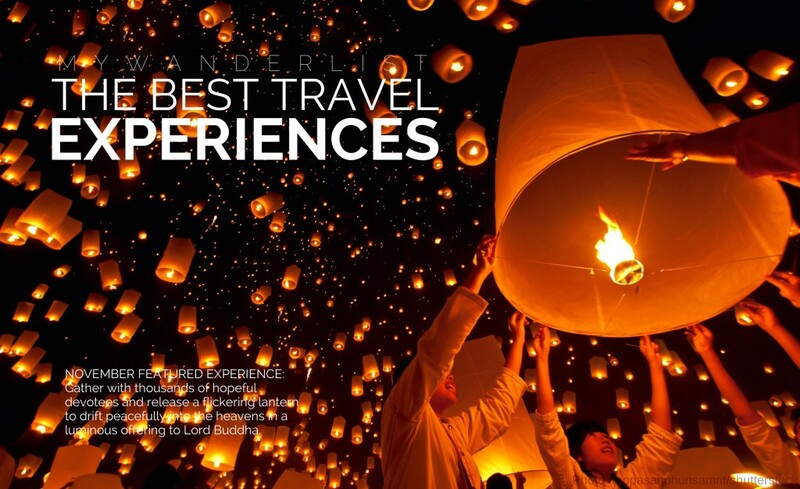 Let me know if you you every find an exceptional experience I should add to the list. Nice post, thanks for the ideas. Given the fact that only last week there was major fighting going on in Saana, the answer to the question, is it safe, is no. Annoying as it’s the one place in the world I most want to visit. What an amazing list!! 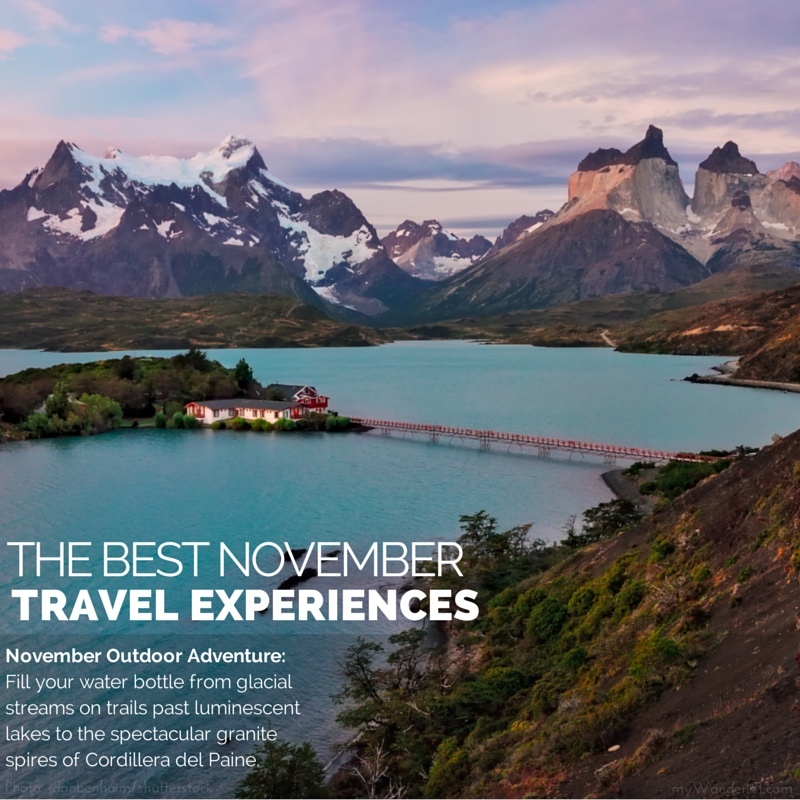 I can vouch for the beauty of Torres del Paine in Patagonia and I can’t believe the one about the live crabs from a vending machine!! The one that I think sounds absolutely magical though is the lantern festival in Chiang Mai – I saw another blogger put up a photo of that festival just today and it looked absolutely breathtaking! Brad, this is an awesome list! I never know where to head in the autumn so thanks for these amazing ideas! I’d love to see Patagonia and the lantern festival. Thanks, Miriam! Have you done any of these? 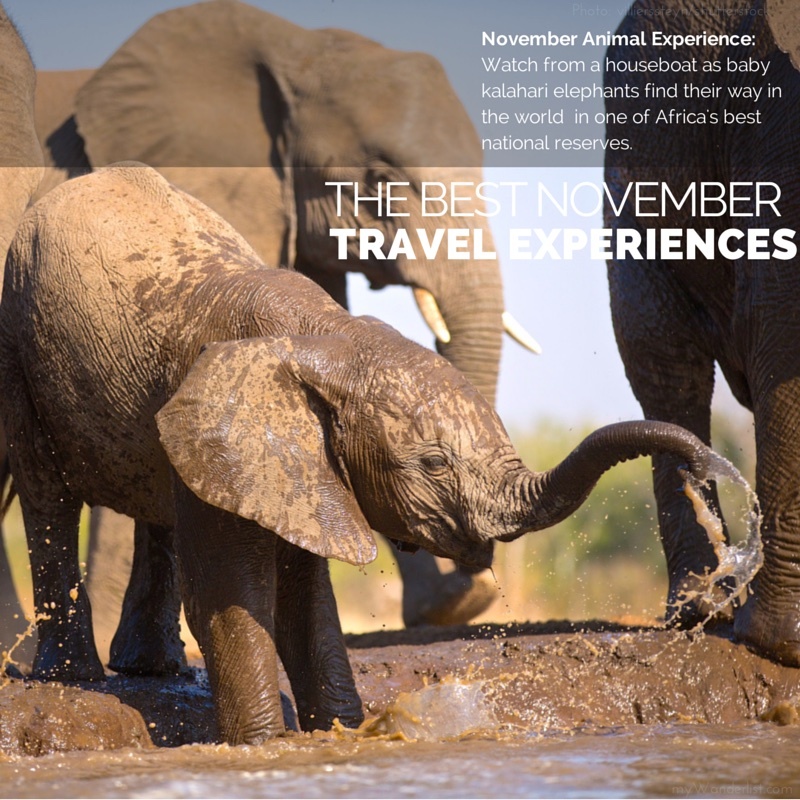 What are you planning this autumn? Patagonia is definitely a dream land of impossible beauty, you just drink from the streams and eat anything that grows on trees. That with the almost 20-hour days makes time seem to stand still. I am definitely planning to go to the lantern festival next year. 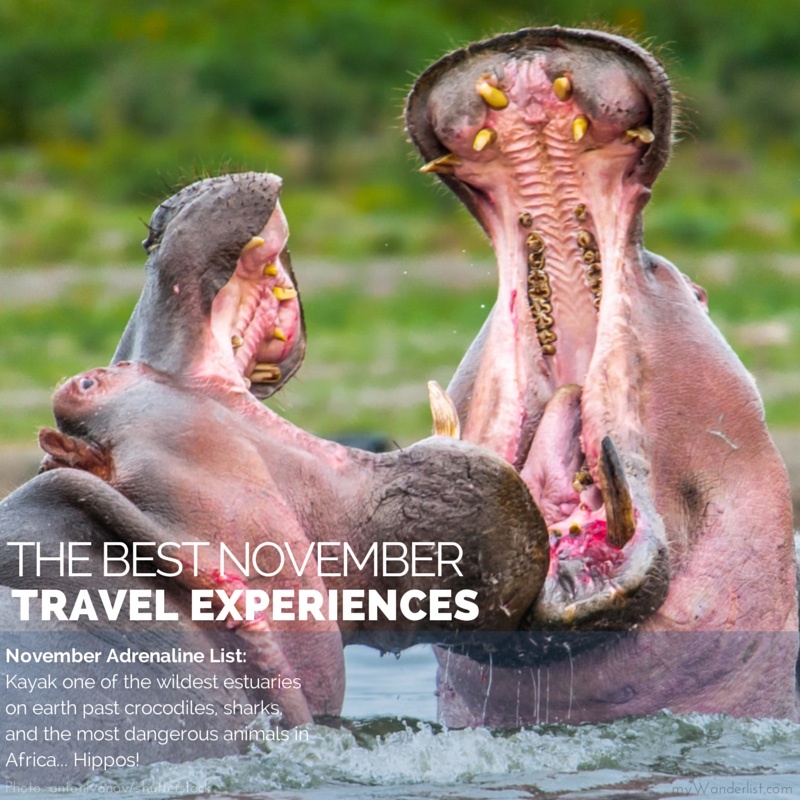 It’s like you’ve written items for a bucket list I didn’t even know I had…another awesome month. Thanks, Anne! 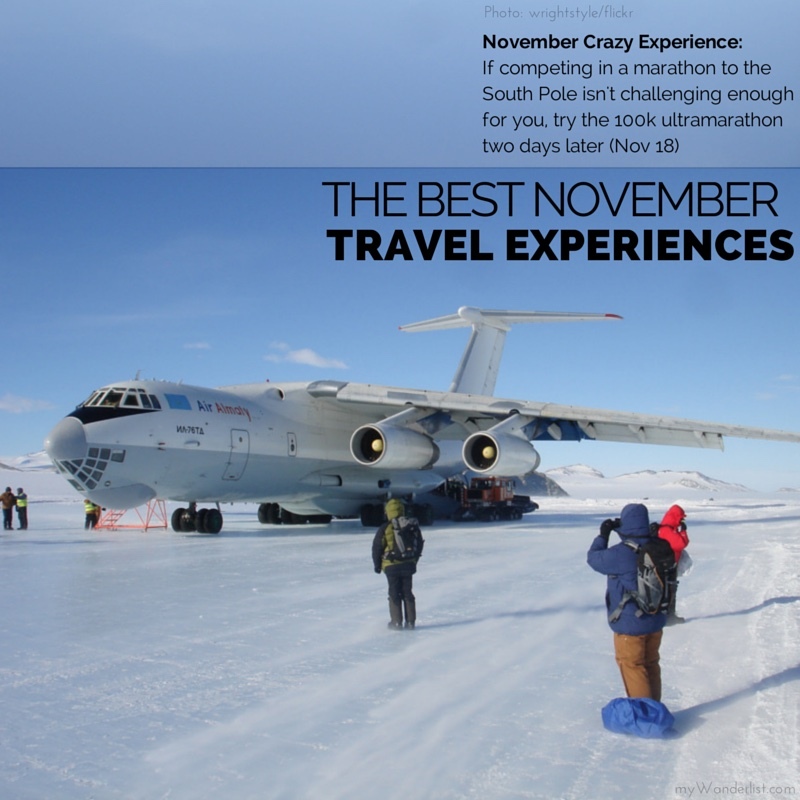 You now have a ‘Just Plain Crazy’ bucket list now too?